Bob Dylan began his first tour in seven and a half years on January 3, 1974 in Chicago, supported by The Band, who were not merely the backing group but co-headliners. They did forty shows, and I’ll have a lot to say about this tour this week as I listen to it (of course, Before the Flood is a good way for you to keep up with it as well). 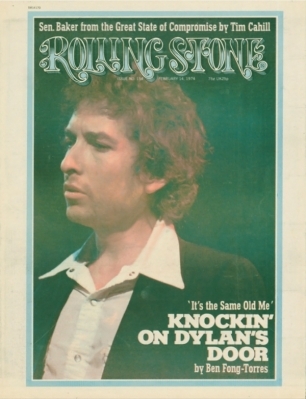 Before I get to that, however, I’ve been reading some of the early-1974 press coverage of Dylan. He had avoided the press for most of the past several years, so with the return to the spotlight I’m sure that the media was eager to get a hold of him and put him on the record. Nonetheless, he gave only a couple of interviews. 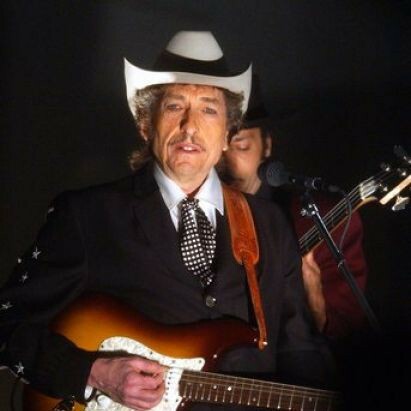 Bjorner lists interviews with the New York Times, Washington Post, Time and Newsweek, and Ben Fong-Torres also wrote a lengthy report about touring with Dylan for the first seven or eight shows and trying to get a chance to talk to him (which he never really does). The best pieces is the one in Rolling Stone, which you can read in its entirety here (and kudos to Rolling Stone for putting so much (all?) of their archive online for free, I had to hassle with my university’s paid subscriptions to read the other articles). To analyze what he meant by “We’ll be back in 15 minutes”? “Right, they start counting to 15 backwards . . . they just take it and they get silly. Dylan, in Montreal, responded: “They just don’t understand.” He shrugged his shoulders. “It’s got nothing to do with that kind of atmosphere. What the critics expect is what they expect. It concerns me more with getting it to the people. Interestingly, Dylan will start to talk more by the end of the decade, and we’ll get to that when we get to it, but I found this pretty interesting, since it’s something I’ve always wondered. Off the top of my head, I can only recall personally seeing Dylan talk from stage maybe once in my life. The other pieces in the NYT and WaPo are not really that interesting, with one exception, which probably spoiled the opportunity for all other journalists to get Dylan on record. When Dylan spoke with Tom Zito of the Post he was asked why he wasn’t doing benefits for politicians, while he had done George Harrison’s Concert for Bangladesh. Dylan replied: “George McGovern wasn’t starving. He just wanted to be President.” The story goes that Dylan asked Zito not to run that quote, having thought better of it, but Zito didn’t grant the request. Dylan only gave one other interview in 1974 after that, ending his brief reunion with the press. Anyway, read the Rolling Stone piece – it has a great scene with Dylan and The Band in Toronto going to see Ronnie Hawkins, and is otherwise a beautiful example of the genre of RS writing where the reporter reflects on hanging out in hotel rooms being ignored by the subject of the article that Cameron Crowe nailed so well in Almost Famous.